High strength and resistance to oxidation, carburisation and other harmful effects of high temperature exposure. Exceptional resistance to many aggressive corrosion by sulphuric and phosphoric acids. Wire diameter range from 0.1 mm to 9.0 mm. Incoloy wire includes Incoloy 800 wire, Incoloy 800H wire and Incoloy 825 wire. Incoloy 800 wire is widely used in equipment that must have high strength and resistance to oxidation, carburisation and other harmful effects of high temperature exposure. Incoloy 800H wire or 800 HT wire are used for service requiring optimum creep and rupture properties. The high contents of nickel and chromium in the alloys also give good corrosion resistance. Incoloy 800 is a solid solution strengthened alloy of nickel, chromium and iron with small additions of aluminium and titanium. Incoloy 800H and Incoloy 800HT are developments of Incoloy 800, which give better performance at high temperature. ASME design codes give significantly higher design strengths for Incoloy H and HT than Incoloy 800, and allow their use to higher temperatures. AS1210 prequalifies Incoloy 800 for use to 800℃. ASME specifications allow the use of Incoloy 800 to 815℃, and of Incoloy 800H and 800HT to 982℃. 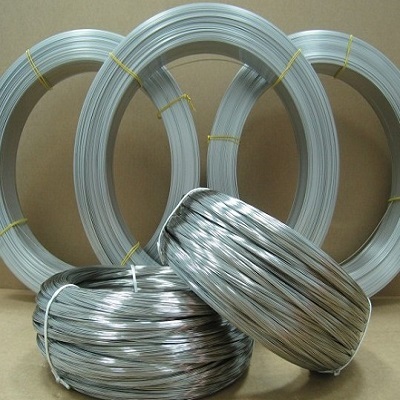 Incoloy 825 wire is a nickel iron chromium alloy with additions of molybdenum, copper and titanium, with exceptional resistance to many aggressive corrosion environments. Incoloy 825 is highly resistant to corrosion. It has high nickel content, sufficient to resist chloride ion stress corrosion cracking, and a very stable austenite structure. The levels of molybdenum and copper enable the alloy to resist reducing agents and acids. Chromium gives resistance to oxidizing conditions, such as nitric acid solutions, nitrates and oxidizing salts. The alloy is titanium stabilized to resist pitting and intergranular attack after fabrication, particularly welding, which includes heating in the critical sensitization temperature range (650℃ – 760℃). Alloy 825 wire offers exceptional resistance to corrosion by sulphuric and phosphoric acids and is often the most cost effective alloy in sulphuric acid service.